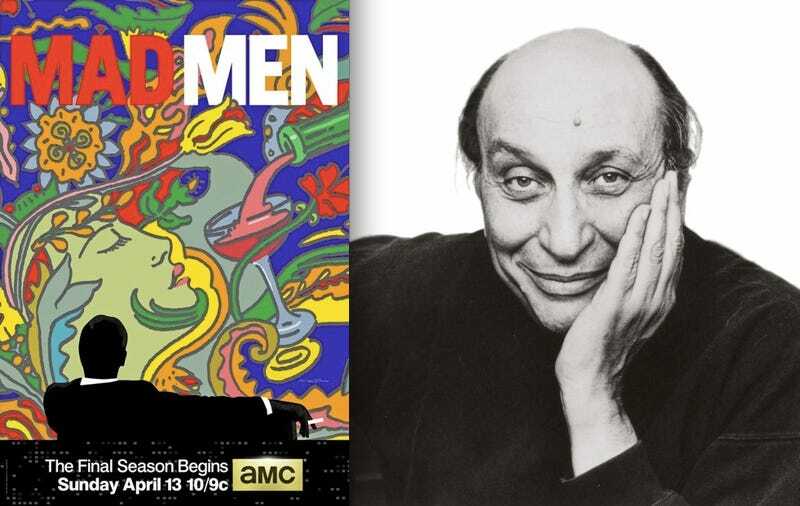 84-year-old Milton Glaser—one of the world's most sought-after graphic designers, who left an indelible mark on advertising in the 1960s—has designed the posters and promotional pieces for the next and final season of Mad Men. The poster and ads he came up with read like a sly reappropriation of his past, a shaggy explosion of color, flowers and Art Nouveau curves on top of which is the by now familiar back-of-the-head silhouette of Don Draper with his arm extended over a chair and a cigarette in his hand. What first reads as abstraction resolves into a profile of a woman's face, the spire of the Chrysler Building and a glass into which wine is being poured. Weiner loves to make these nods to history, and this is probably one of his most wink-wink moves yet. In 1968, Glaser would definitely have been hired by Sterling Cooper & Partners for one of its campaigns. In fact, he was only a few years away from founding his own firm, and was already getting choice commissions as a member of Push Pin Studios, which he had founded in 1955 with Seymour Chwast and Edward Sorel. At the time, Glaser's most legendary work was this 1966 poster for Columbia Records, included in Bob Dylan's greatest hits album. I could totally imagine this poster tacked onto the wall in the room where the creatives brainstorm. 1968 was the year that Glaser founded New York Magazine with Clay Felker (where he also penned a food column on affordable eats called "The Underground Gourmet"). It was quickly found on every New Yorker's coffee table. Wouldn't this totally be something Roger Sterling would read? In 1977 Glaser was hired by the ad agency Wells Rich Greene (which bears many resemblances to Sterling Cooper & Partners) to promote tourism in a downtrodden New York City. It has become one of the most famous (and emulated) logos in the world, and would make a great plot point (if Mad Men goes that far into the future).